First thing that was highly evident at the Golden Globes Awards tonight was the amount of black being part of the Time’s Up movement. 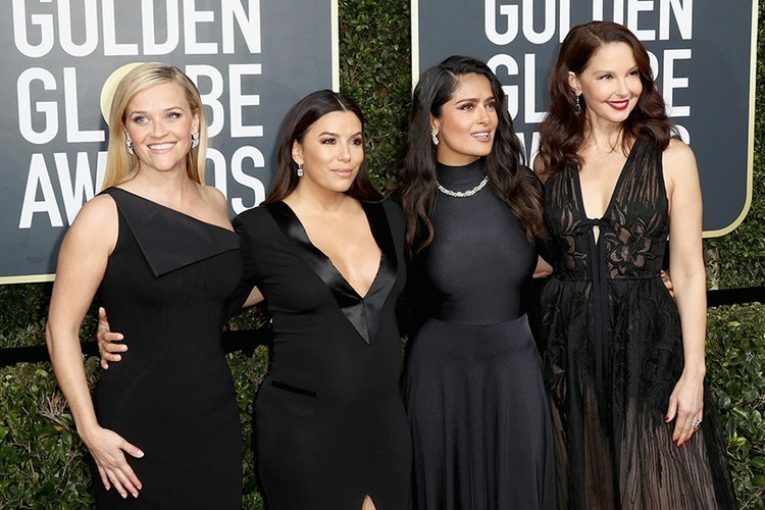 The Golden Globes Awards Blackout was to call attention to the sexual harassment that has been happening in Hollywood and beyond for years. However, it truly seems that 2017 was the year people had enough and people started to use their voice. Looking at how the first award show of 2018 is starting off by taking a stand, it looks like this is going to be the year of making sure voices are heard. Let’s be real, we cannot just talk about the Golden Globes #blackout attire without talking about who wore it best. Gal Gadot from Wonder Woman looked simply amazing. Also the lovely Catherine Zeta-Jones looked flawless and absolutely came to slay. Issa Rae did her thing tonight with not only having a slight train, but having a fabulous split with just the right amount of class. Over all the Golden Globes Awards show was a major hit and was a good controversial way to kickoff 2018 especially in todays hostile political environment. Here’s to hoping that tonight’s Golden Globes Awards statement will continue to resonate throughout 2018 and beyond. For more information about the Time’s Up Movement, please visit their website at https://www.timesupnow.com/.